Matt's posting Charlotte's Web colourways over at the Charlotte's Web Close-Up page on the ThreadBear main site. Go see! Sure, I have 403,287* projects going at any given time. A couple are seriously long-term projects (one shown below, actually), some are longer-term projects (one shown below) and some are itty-bitty little quickie projects (several below). And at any moment, for no apparent reason, I may banish a project to time out--it's not behaving (Koigu Gypsy--with different stitch counts on each side of a center stitch), a tank top project (on hiatus without cause....I should finish it), my version of the RTP poncho (just hanging out for now), Gigi (I need to buckle down and start the sleeves), and so forth......it's not that I'm unhappy with any of these WIPs, but I'm like a raccoon in that I'm attracted by new, bright, shiny projects.......and I need to return to some of the old stand-bys that I've started. OK, confession time over. Please meet Fiona, a cute little bag made of aran-weight cotton. I'm using Plassard Mayotte, which I showed here a bit ago when it came in (click that link to see the colors, and we have them all). A few nights of knitting and I'll show you the finished project!! That's a Lorna's Laces yarn called Fisherman, in Pink Blossom and Carol Green. We've had the pink since someone ordered it and reneged on the purchase when it came in. So in my conversation with the good folks at Lorna's on Friday, before they sent my every-other-week goodies (yes, they ship to me every other Friday), I asked what they had in Fisherman, as we're going to carry this specific fiber in depth when we move into the new space. My good buddy there said "nothing but screaming Carol Green--want it? ", and I thought of my languishing pink, thought of felting, and I yelled SOLD. So off to the project races I go, with 1,000 yards of pink and green yarns. YES! Speaking of new yarn from Lorna's, we received a monster box from them yesterday--so let's do a quick review! I see these two being a good thing, given the season's color palette---and my obsession with a certain Lily. But wait, there's more! As you all know, we did get a little influx of Koigu yarns on Monday. And a long phone conversation (well, three different calls, the last of them a nice, long one) with Taiu tells me more about what to expect and when. I'm a happy man, yet I have to practice patience! But for now, many of you were enamoured with Maria when I introduced her on Monday, and many of you asked for options....Who am I to let an enabling opportunity pass by....here you go! The shawl calls for 400g (8 skeins) of Painter's Palette, so I've only shown you those colourways that we have at least that much in, in case you are interested in getting ahold of one for yourself. Let me know! The top row is the start, moving right, then down to the bottom and left to right, ending with the lower right-hand yarn. And I took it off the needles to cast on all over again so I can start it off right! And with that, I'm done for the day. I have another post in the wings, for tomorrow. But for now, it's time to get ready for the day, as we open in 20 minutes at noon (yes, this post took over 2.5 hours......WOW). Matt posted new Charlotte's Web options over at the ThreadBear main site, on the UP CLOSE page for Charlotte's Web. And some of those below here are still available (Winter Sky is gone.........seven times over, if we had them--but there was just the one). News Flash---our first installment of our Diakeito Yarns has left the distributor (Friday) and is expected here probably Wednesday. I'm hoping it has our Diamusee--which is very Kureyon-like in coloration but 400 times softer--and Diadomina. We ordered a good bit from them (about $20,000 retail worth of yarn), and it will all be here by June 1, they said. Also in the wings and waiting for us is our first shipment of Muench Yarns, the first of the over $40,000 (retail) we ordered from them. I'm not sure when we'll expect it to arrive, but I know it's about to ship. Soon. Well, off to the races for me. Many of you want packages of yarns, so I had better get something packed and out of here, no? Our poor letter carrier had three tubs of packages and a stack of boxes on Saturday, and today isn't much easier (no big stack of boxes, but a nice batch of tubs). She's earning her keep....bet she can't wait for us to move the shop to new digs and OFF of her route! Be well.........we'll talk soon. And go see Matt's new Charlotte combos! Radio programs often rerun programming on the weekends, especially their morning shows. So why not do a little bit of review here, ourselves??? Away we go! First off..........we'll still feature some Charlotte options here for the the time being, but one change we're implementing is to feature them on the "Up Close" page for Charlotte's Web at the ThreadBear main site. All activity will be posted there, and I'll try to let you know over here to go looking over there when there's fresh......but you can always look yourselves, as well. (there are six new options over there right now....waiting for you.....). And now for "The Best Of Charlotte" over here ........ sorta. These are options that exist for one reason or another. Sometimes then went overlooked when they were posted. Sometimes they were spoken for and then someone saw something else and switched. Sometimes the entire transaction didn't get completed for any number of reasons. But as of 10 p.m. EST tonight, Sunday, May 2nd, these are available....and they're all SINGLES.....no duplicates can be made of them because stock doesn't exist to do multiple variations.....so away we go! This beauty has a skein of P610 in it, and that's one of my favorite colourways from the folks at Koigu. I like this one! Colorful and bright and probably quite fun to knit. Up for it? Hydrangia was almost adopted out, but then someone changed her mind to a different combination. Won't you show a little love for her? 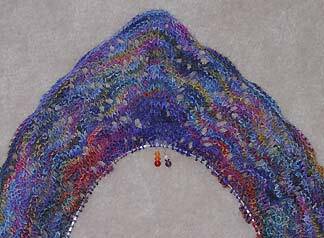 It's a beautiful melding of some of the skeins with pepper dots in them. While they look unusual i the skein, they knit up with these intense little pops of color. Quite nice! Deep and brooding and just what a jewel-tone lover needs! Acid Test is still ready for your needles. Won't you show the love? given the tones and skeins found in this combination. She nearly headed to Switzerland, but another option won out, so she's here and ready for a good home. So, there's seven here and six over at the Charlotte Close Up page......happy hunting!